About the Michelada, about us, and about Day of the Dead. A Michelada is a spicy, savory and refreshing beer cocktail. A unique blend of spices and lime are added to beer create a sensational year-round drink typically served over ice with a salted rim. Rumored to have originated in Mexico in the 40‘s, it's been extremely popular since. However, being rather new in the States, there is some controversy as to the origin and what constitutes a “real Michelada”. 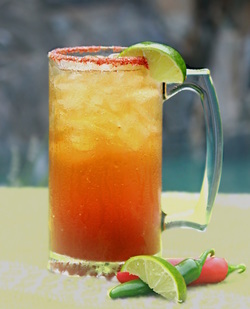 Some insist that an authentic Michelada contains no tomato product. Others make it with either tomato or clamato juice, and in some parts of Mexico it is simply lime juice and salt added to beer. It is as versatile as our Bloody Mary and there are many variations, none right or wrong. Here at Moondance Michelada Mix we start with an original Mexican recipe, but we believe that with the Michelada, there are no rules! Want it spicier? Add more hot sauce. More tart? Add more lime. More of a kick? Add vodka or tequila. Try it with Clamato or tomato juice for a (Chavela). Our mix also makes the perfect marinade for steaks, chicken, fish, or even tofu. It's great added to all of your favorite recipes to spice them up and add flavor. It can be added to soups, sauces, and dips. With Moondance Michelada Mix there are NO RULES! Have fun and experiment. SALUD! On a trip to Mexico in 2005, my friend and I came across a little hole in the wall in Zihuatanejo that caught our attention by a constant stream of people going up to the counter and ordering this mysterious concoction in a tall styrofoam cup made with beer. We watched intently at how they were made quickly ordered one to try. Where had this been my entire life? I was hooked! A couple of years later, April (my daughter) and I visited what has since become one of our favorite places in the world, San Miguel de Allende. We proceeded to order a Michelada in just about every establishment we visited (that was a LOT) and knew that we'd have to learn to make them ourselves when we returned to the States. Realizing that they took special attention and several ingredients to make, we came up with the idea of creating a ready-made mix. We let the idea simmer until the timing was just right. With articles on the Michelada being a top food trend of 2015, enough people knew what a Michelada was and it was time to concoct the perfect Michelada mix to bring to the world. We spent another month in San Miguel de Allende and befriended Mexican chef and amateur artist, Fermin Gordillo. His artwork inspired our logo and his Mexican tastebuds approved the final recipe. We are thrilled to finally be able to share our mix with the world and to make the Michelada a household name!